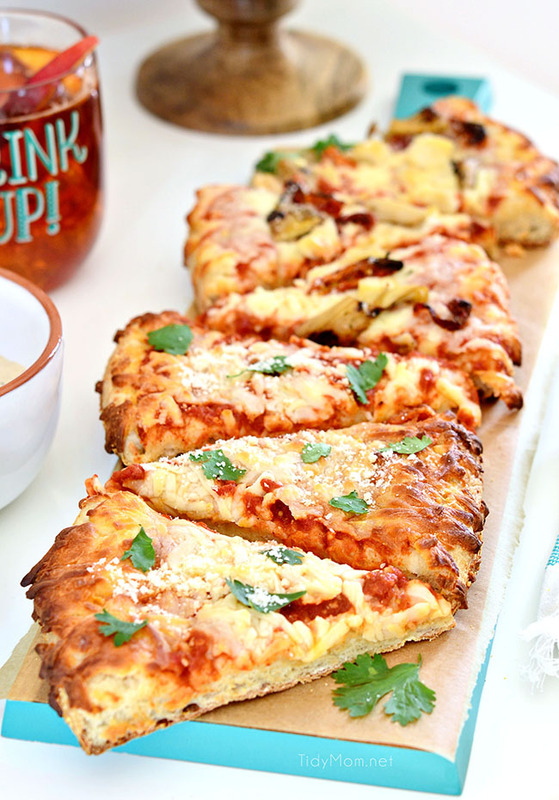 Start with an oven ready cheese pizza and your favorite toppings for a fresh pizza at home! 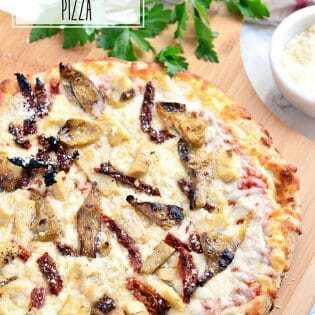 Like GRILLED ARTICHOKE CHICKEN SUN-DRIED TOMATO PIZZA we made for a girls night pizza party. Whether it’s a girls night to watch your favorite show, or getting together with a few friends to catch up, a night at home with your best gal-pals is a great way to step back from hectic schedules and unwind. 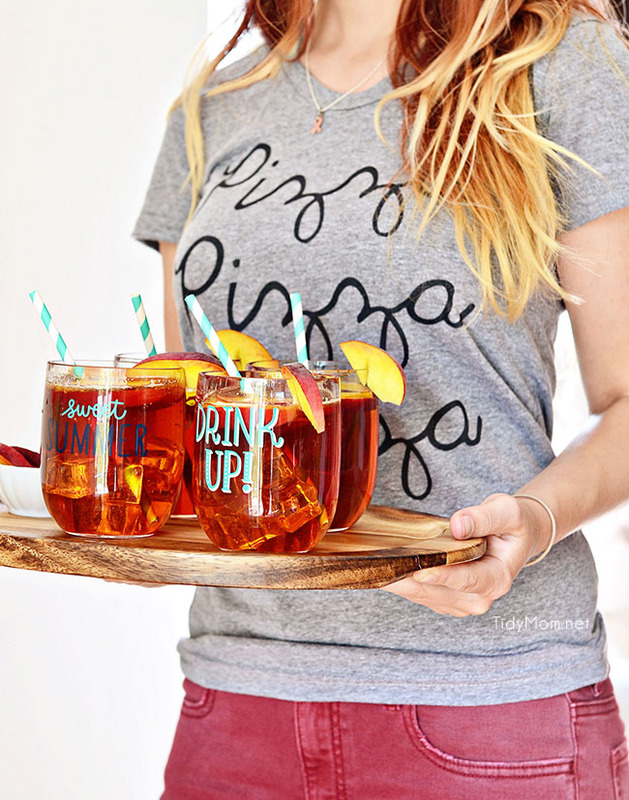 As part of my ongoing partnership with DIGIORNO pizza, my daughters and I are sharing some fun simple ideas for a Girls Night Pizza Party at home. All quick and easy ideas you can do in 20 minutes or less while the pizzas are baking in the oven. 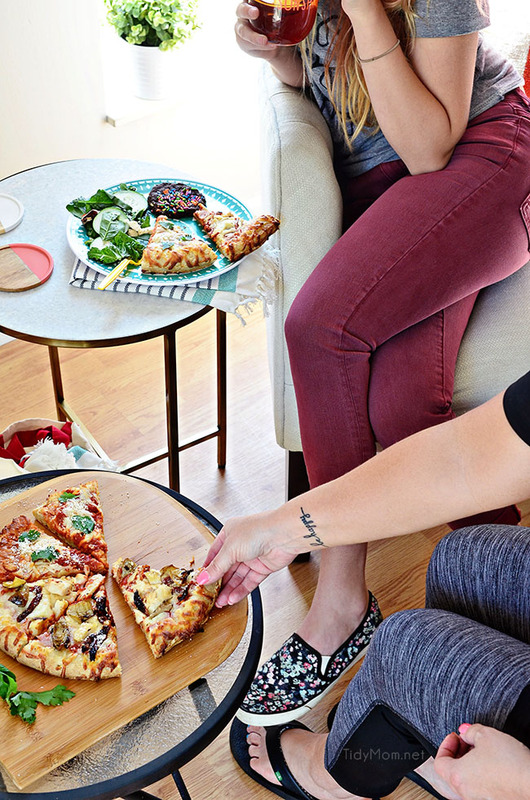 DIGIORNO pizza can help you rise to the occasion by baking up hot and fresh pizza with a perfect crust right in your own oven, giving you more time to spend with your guests. 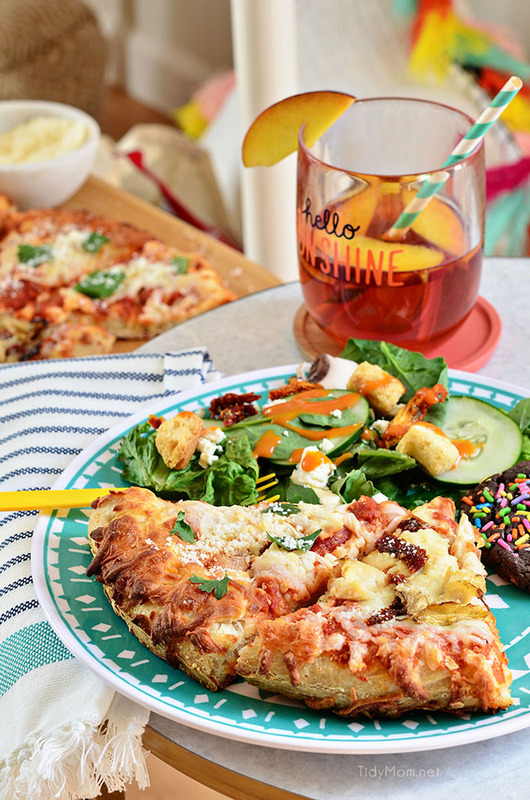 Customize a DIGIORNO Four Cheese pizza with your favorite toppings, add a salad bar, store bought treats and an ice cold drink and you’re ready for a memorable Girls Night Pizza Party! 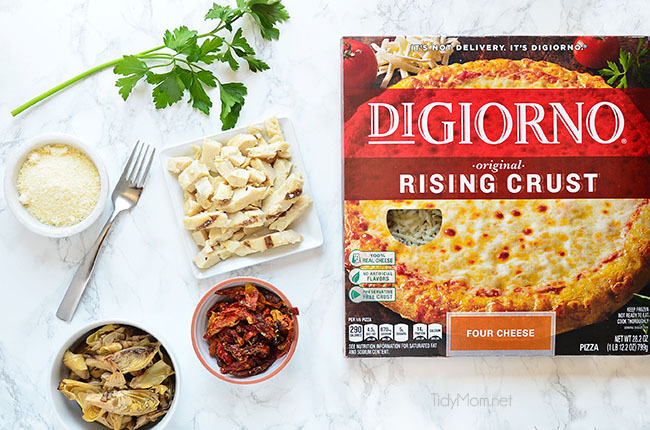 I like to keep DIGIORNO Original Rising Crust Four Cheese pizzas in our freezer, because everyone likes cheese pizza, they are also great for customizing with some of our favorite toppings. Get creative! For our TV watch party we added grilled artichokes, chicken and sun-dried tomatoes for a delicious pizza pie! Top with artichoke hearts, grilled chicken and sun-dried tomatoes. Season with garlic powder and pepper. Finish by topping pizza with parmesan and bake according to package instructions. Remove from oven top with a little more parmesan, slice & serve. To cook two DIGIORNO Original Rising Crust pizzas at once. Preheat & Bake at 400°F. Keep pizzas frozen while preheating. Remove pizzas from box, discard overwrap and cardboard. Place pizzas directly on oven racks—either side by side on the center rack (if you have room), or one on second rack from top and the other on second rack from the bottom of the oven. Bake about 20 minutes. Once golden brown, dish up and enjoy! I garnished the other DIGIORNO pizza with parsley before serving. While the pizzas were in the oven, we quickly set up a salad bar. Fill out your spread with store-bought items. 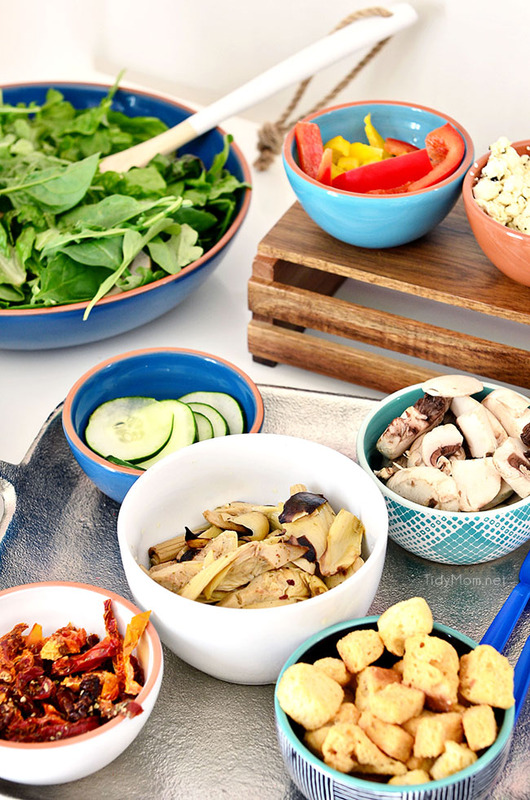 For our menu, we included jarred olives and artichoke hearts, sun-dried tomatoes, red and yellow peppers, pre-sliced mushrooms, cucumber slices, croutons, cheese and salad dressing — colorful, flavorful ingredients that didn’t require much additional work beyond transferring them from a container to a bowl. Many salad dressings are quick and easy to make; Honey Dill Vinaigrette Dressing is a favorite at our house. Make it easy to serve one handed. Tongs are useful, be sure to have serving spoons or forks and small ladles or soup spoons to serve dressings. 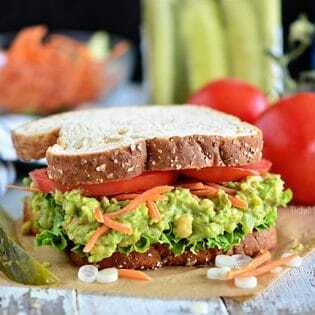 Take into account whether your guests have big or little appetites, what you happen to have in the fridge, and your personal preferences for what goes into a salad. Feel free to tinker with the toppings to make the salad bar your very own. Any leftovers can be tossed together for a lunch box salad for the next day. Don’t forget sips and sweets for your guests! 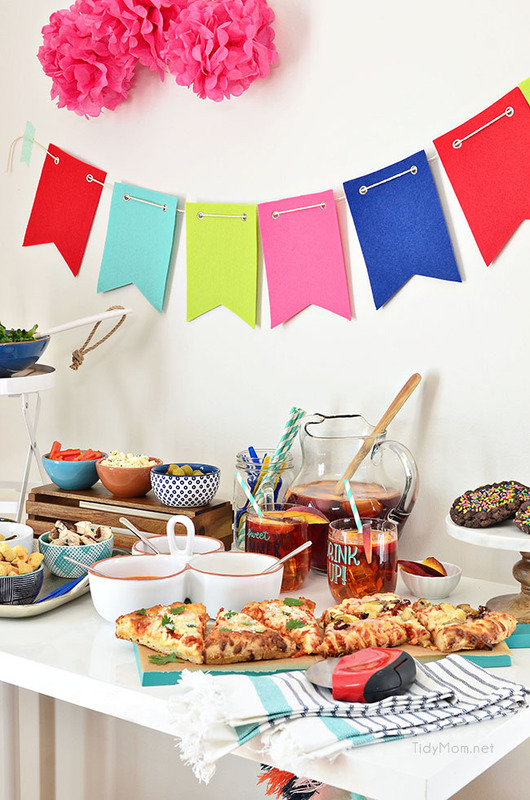 For our party, we served up peach iced tea (or you can buy instant peach iced tea) as well as store-bought chocolate cookies with colorful sprinkles. What toppings would you customize your DIGIORNO RISING CRUST pizza with? Be sure to rise to the occasion and include DIGIORNO Original Rising Crust pizza for your next gathering! You can find more recipes, entertaining ideas and pizza tips featuring DIGIORNO pizza on Pinterest, Facebook Instagram and Twitter! 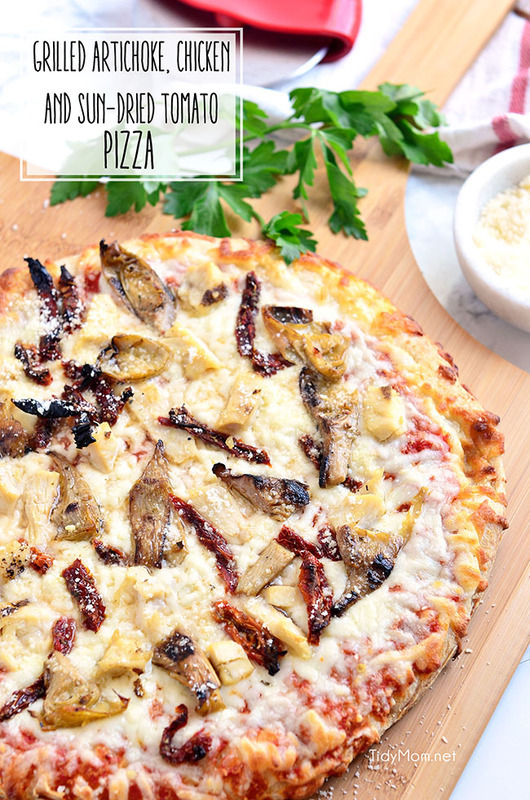 Like this ARTICHOKE CHICKEN SUN-DRIED TOMATO PIZZA? PIN IT! This pizza is everything!!!! I love the flavors. Yes! I love this easy Girl’s Night! And the pizza looks amazing – gimme! What a fun party!! Your pizza looks fabulous and I love that you can customize it!!! How fun! I love that pizza! 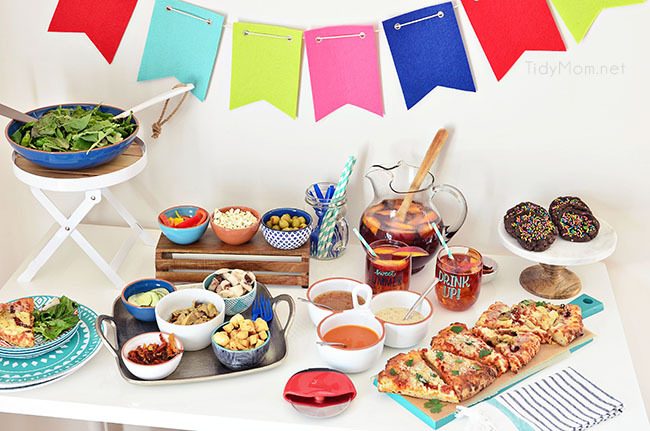 This looks like the BEST pizza party EVER! Yum! 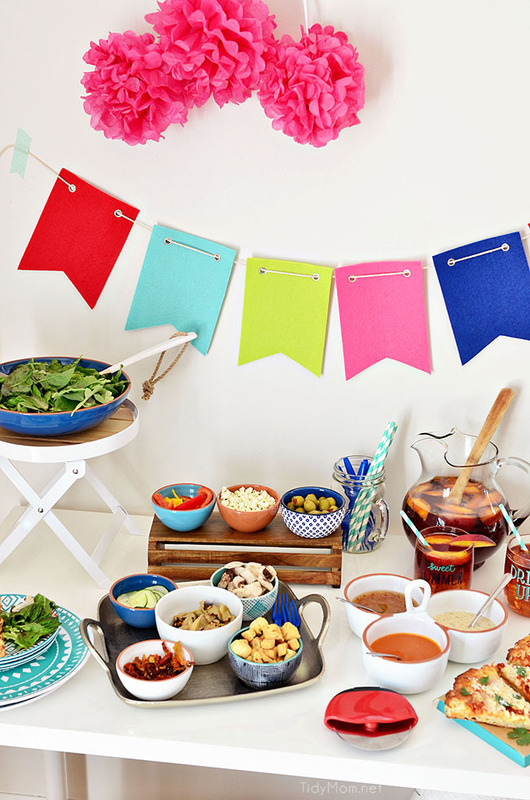 Such great ideas for a party. I love how you customized a cheese pizza, it looks fantastic! I never would have thought to get creative with a pre-made pizza! love that idea though! Love all the yummy flavors, can’t wait to try it. I love their pizza, this is such a great way to jazz it up and customize it. Very cool table set up too. 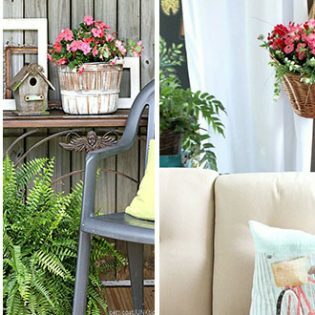 I love the way you decorate and make everything look so gorgeous. I need to take more time to do things like that. 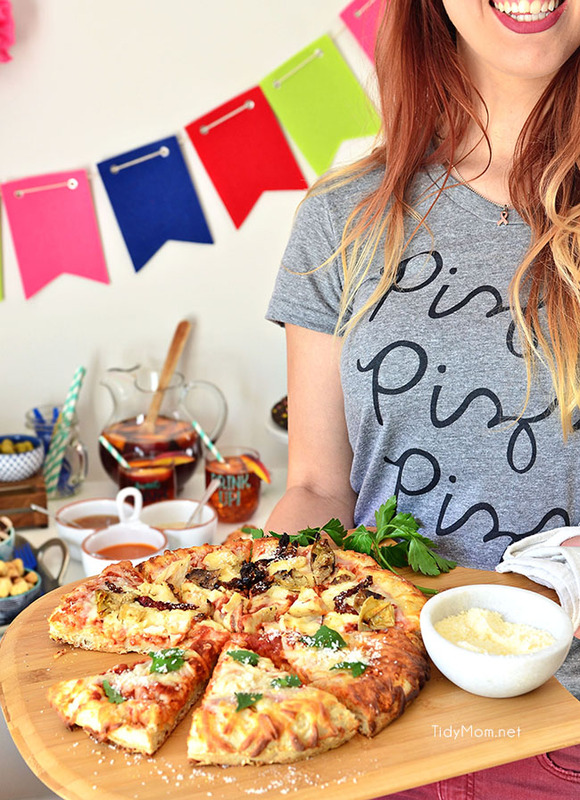 We love to “dress up” pizzas. Yours look better than any I’ve come up with, though!! What a great idea, Cheryl! I love this!!!!! A great idea for a party appetizer or main! I’m drooling over these pizza toppings!! Perfection! You and Sandy have me hooked on these pizzas. 🙂 I’ve bought them several times so far this summer for fun (easy) pizza nights. They went over very well while we were on vacation too! I love your entertaining ideas! Absolutely love DiGiorno pizzas and this is a fabulous flavor combination! I’m with Aggie, I love your entertaining ideas 🙂 Gorgeous pics, makes me want to come over and join in! Cheryl, this is great recipe. Thanks for sharing. Mmmm! Looks so good! I love artichoke pizza! Yum! I’m vegetarian so I subbed out the chicken with some veggies (olives and green onions). Loved it – thanks for sharing!